(CNN) -- Activist and Nobel Peace Prize winner Malala Yousafzai challenges education systems across the world, including in her native Pakistan. After she was shot by the Taliban, she became a key figure in the movement to improve education in the country, particularly for girls where the widest education inequalities exist. 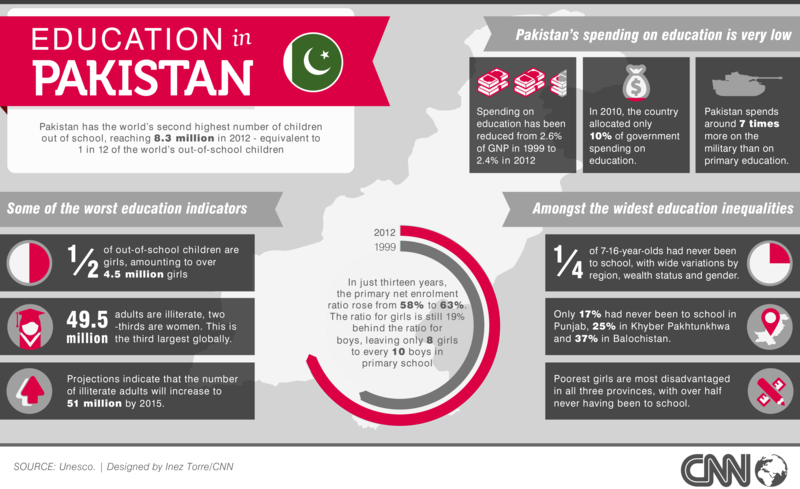 According to UNESCO, more than 4.5 million girls are out of school in Pakistan, while spending on education has decreased to 2.4% of GNP in 2012. UNESCO also says that for every 10 boys there are only eight girls in class and that the poorest girls are the most disadvantaged.